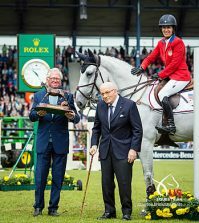 25 March 2017, Wellington, USA – Spain’s Sergio Alvarez Moya riding Charmeur took title place on the podium in the Rolex Grand Prix, the highlight of the Winter Equestrian Festival (WEF). After a sun-drenched day and spectacular sunset, the bright lights of the arena were illuminated, ready to welcome 40 of the world’s best horse and rider combinations, from 17 nations, to contend for one of the world’s toughest 5* Grand Prix. 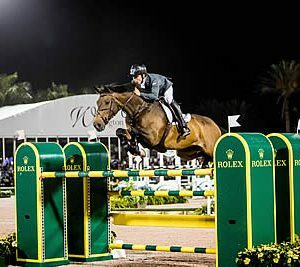 The passionate crowd was treated to a typically demanding course set by the world-famous course designer, Guilherme Jorge. The technicality of the course proved too much for many of the elite riders. From the first 20 combinations to go, there was only one clear round to count for, and in total, only five riders proceeded through to the jump-off. Although Rolex Testimonee Kent Farrington rode to victory earlier in the day, fortune was not on his side in the Rolex Grand Prix. 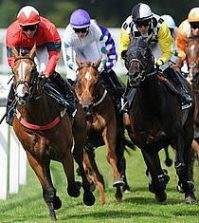 A tense crowd hushed to near silence ready to cheer on the home favourite, until the very last rail was gently rolled from its bracket by a stray hind foot. 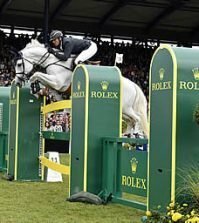 Rolex’s newest Testimonee Jeroen Dubbeldam also suffered an unlucky four faults, halting his chances of reaching the jump-off. However, his quick time placed him in an eventual ninth place. Despite a valiant effort from Rolex’s longest serving equestrian Testimonee, Rodrigo Pessoa, he was also unable to progress through to the jump-off. Karen Polle from Japan was the first rider to enter the arena for the jump-off and set an impressive time of 39.54 seconds, although unfortunately knocked a pole, incurring four faults. Spain’s Sergio Alvarez Moya aboard Charmeur was next to go and recorded an incredibly fast time of 37.76 with no faults, putting pressure on the remaining three American riders left to go. 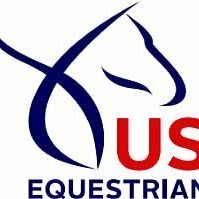 USA’S Beezie Madden and Laura Kraut were unable to challenge Alvarez Moya, leaving it up to McLain Ward, a home favourite and current world number four. Even after a daring round, Ward’s time could not beat the triumphant Spanish rider, who claimed the Grand Prix by just eight hundredths of a second.